which, over time, will provide useful and, I hope, interesting articles for all amateur astronomers. A further aim is to update and add new material to link with the books recently published by Cambridge University Press and which are described on the home page of the digest. It now includes well over 50 illustrated articles. This is perhaps the next star that will be seen to die in a supernova explosion. 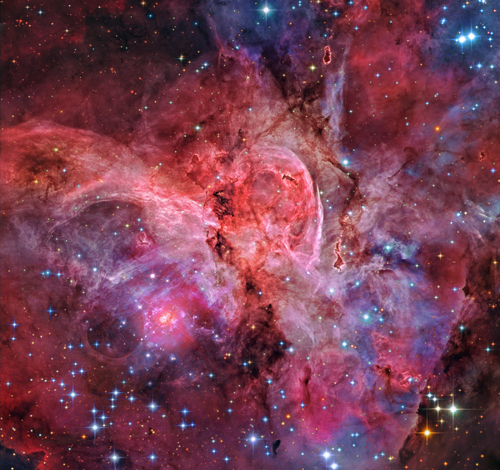 It lies in the Keyhole Nebula at a distance of 7,500 light years and has a mass of around 100 times that of our Sun. 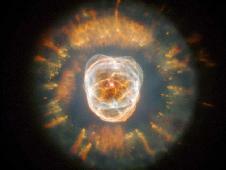 The two lobes of the Homunculus Nebula encompass the hot central region surrounding the star. 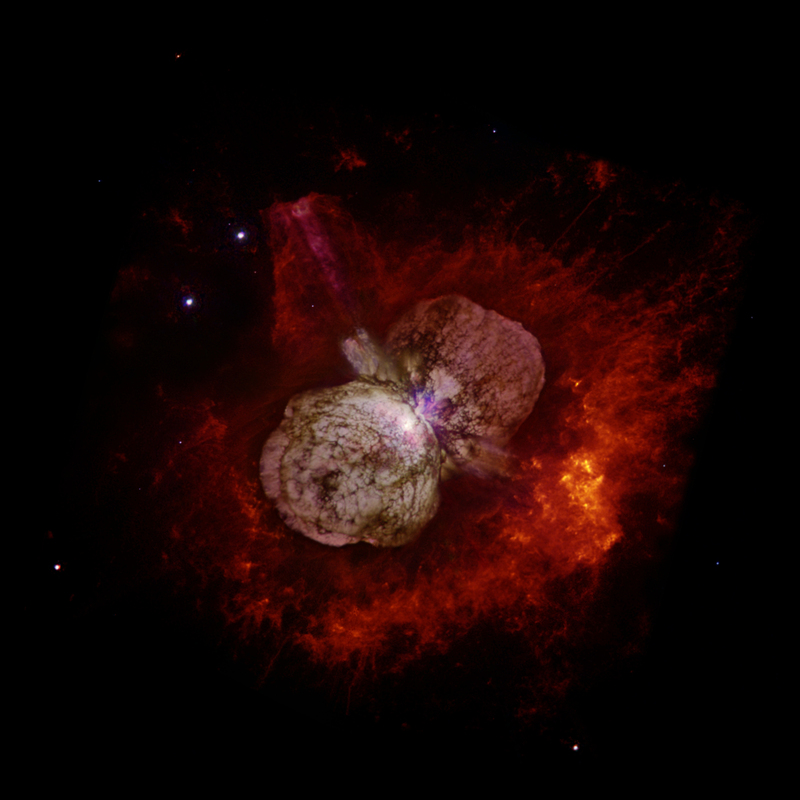 Below is an image of the region containing the Eta Carinae Nebula which, showing deep red H-alpha emission, lies over to the right of the Coal Sack and the Southern Cross. The Southern Pleiades open cluster lies down to its lower left - in this, most beautiful part, of the Southern Milky Way. 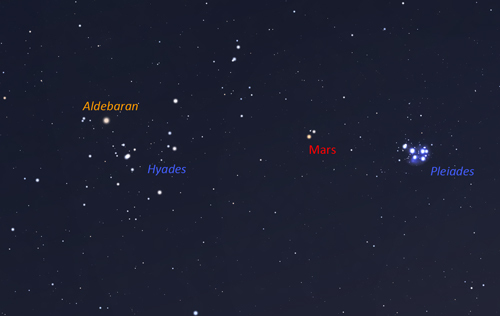 April 5th - early evening: Mars lies betwen the Hyades and Pleiades. 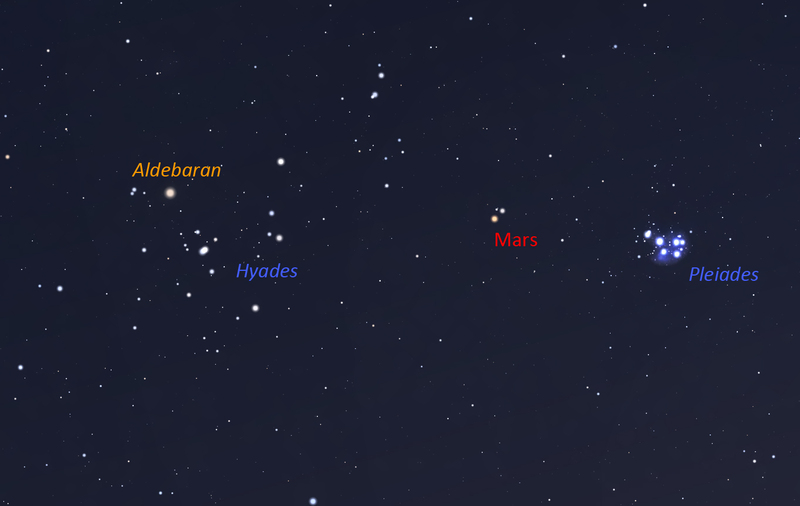 In the early evening looking towards the southwest one should, if clear, be easily able to spot Mars lying halfway between the Hyades and Pleiades open clusters. 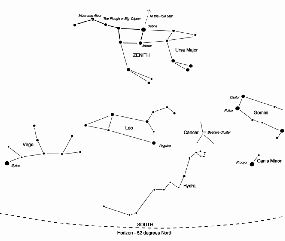 Looking northwest in the evening at an elevation of ~35 degrees should be seen the 'W' shaped constellation of Cassiopeia. 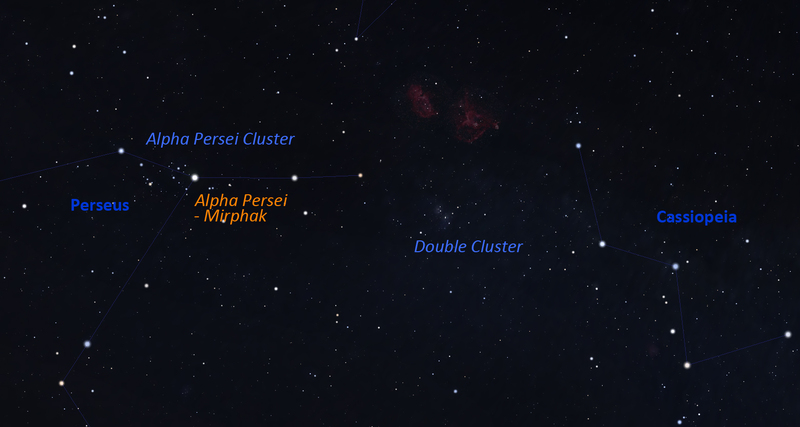 Up to its left lies Perseus with its bright star Mirphak. This lies at the heart fo the Alpha Persei Cluster - widely spread across the sky and about 600 light years distant having an age of ~60 million years. 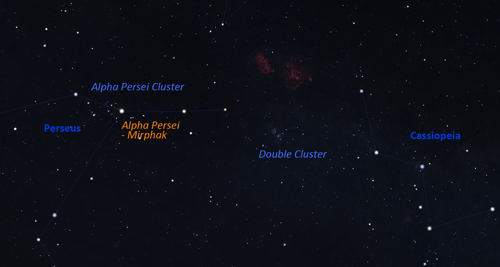 Between Cassiopeia and Perseus can be seen with binoculars or a small telescope the Perseus Double Cluster - the common name for the two clusters NGC 869 and NGC 884. These are quite young with an age of ~13 million years and lie at a distance of 7,500 light years. There are more than 300 blue-white supergiant stars in each cluster. 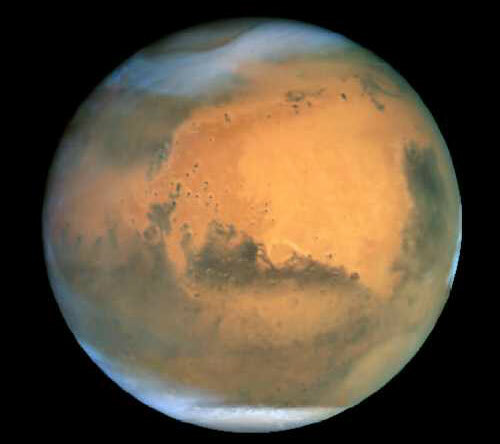 April 9th - early evening: Mars and a crescent Moon in Taurus. Mars and a crescent Moon in Taurus. 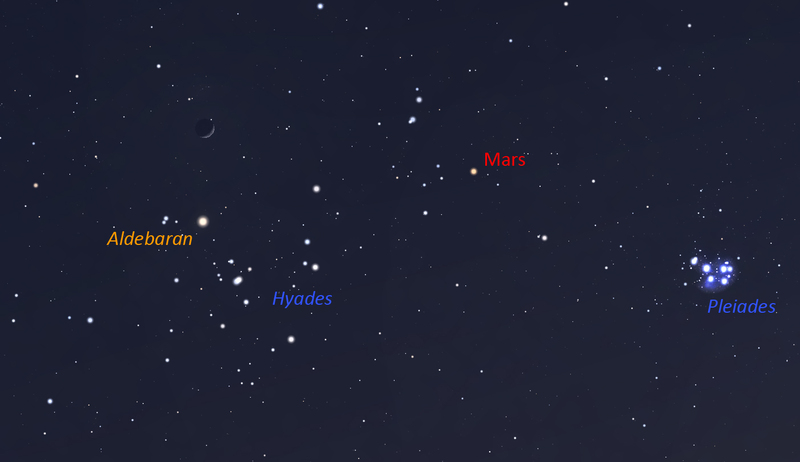 Looking southwest in early evening if clear, Mars and a thin crescent Moon will be seen lying above the Hyades and Pleaides clusters in Taurus. April 10 - evening: Spot Asteroid 2, Pallas. 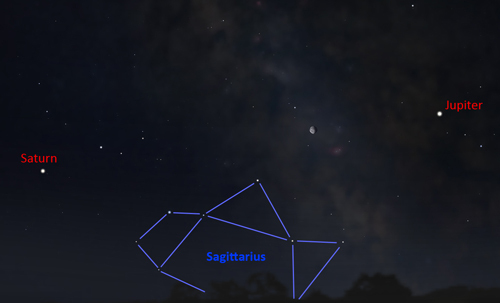 In the evening after dark, the bright star Arcturus will be seen rising in the east. Up to its right is the star Muphrid. 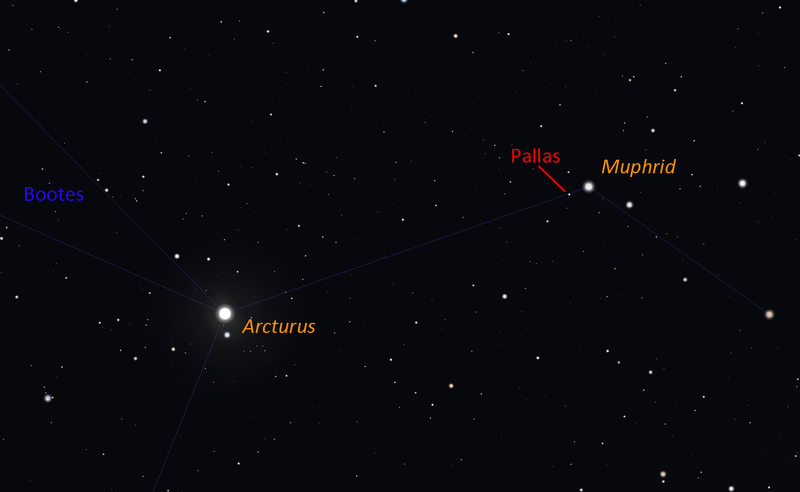 Exactly on the line between them and just to the lower left of Muphrid one should spot Pallas, the second asteroid to be discovered, shining at magnitude 8. Binoculars or a small telescope will be needed. 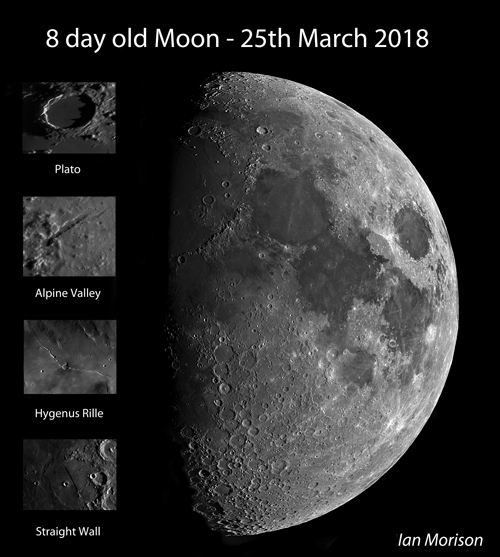 April 15th - evening: the Moon below Leo. A waxing Moon below teh constellation Leo. If clear in the evening and looking south, the waxing Moon just after first quarter will be seen lying below the constellation Leo. 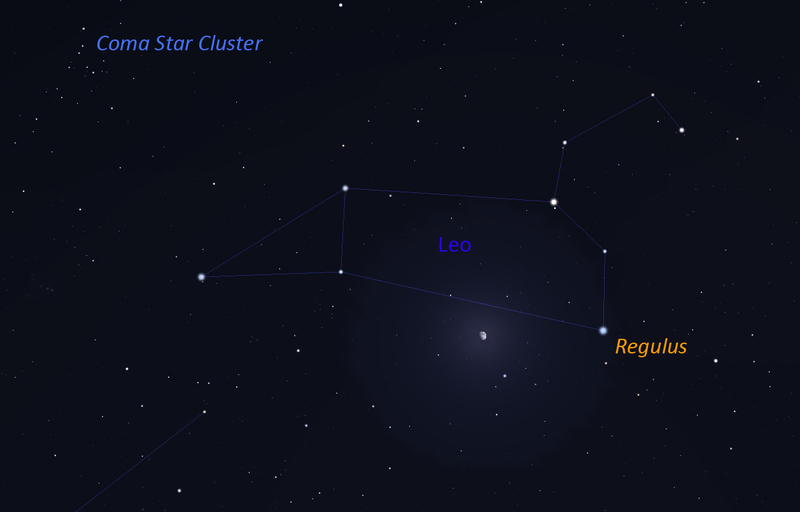 Up to the left of Leo lies the Coma Star Cluster - well seen in binoculars. Jupiter, Saturn and a gibbous Moon. 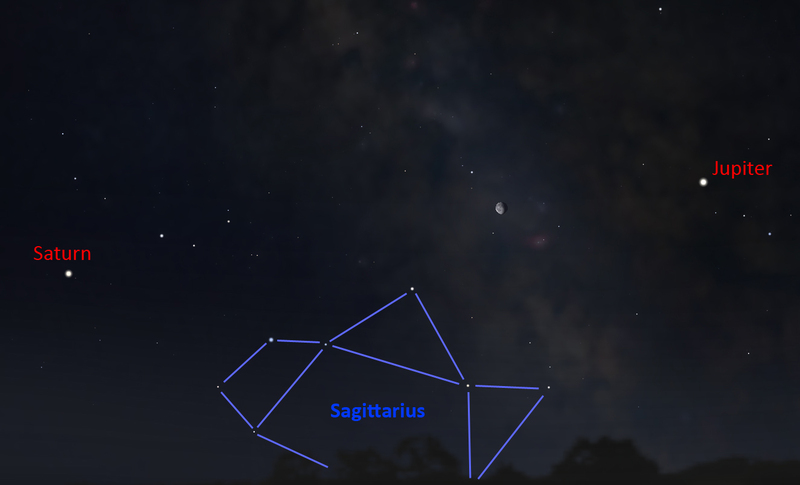 If clear before dawn, and given a low horizon towards the soth, one should easily see Jupiter and Saturn lying on either side of the waxing Gibbous Moon. 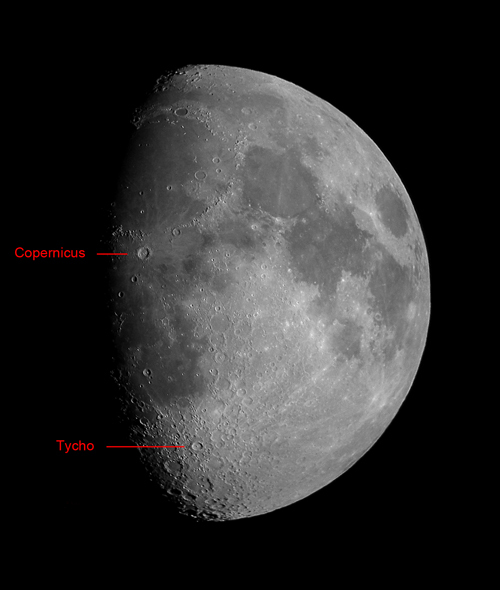 These are two great nights to observe two of the greatest craters on the Moon, Tycho and Copernicus, as the terminator is nearby. 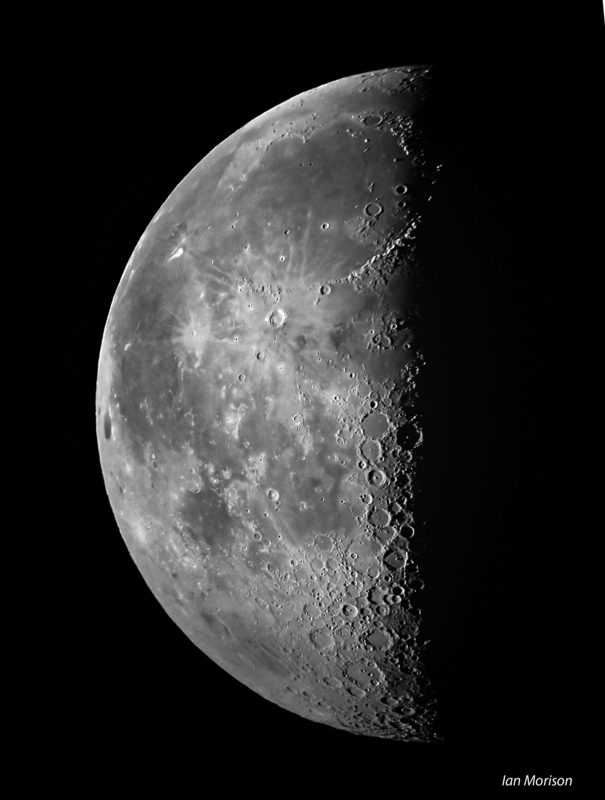 Tycho is towards the bottom of Moon in a densely cratered area called the Southern Lunar Highlands. 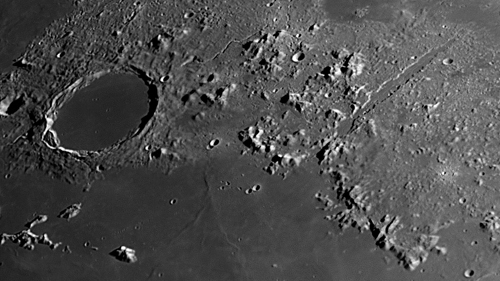 It is a relatively young crater which is about 108 million years old. It is interesting in that it is thought to have been formed by the impact of one of the remnents of an asteroid that gave rise to the asteroid Baptistina. Another asteroid originating from the same breakup may well have caused the Chicxulub crater 65 million years ago. It has a diameter of 85 km and is nearly 5 km deep. 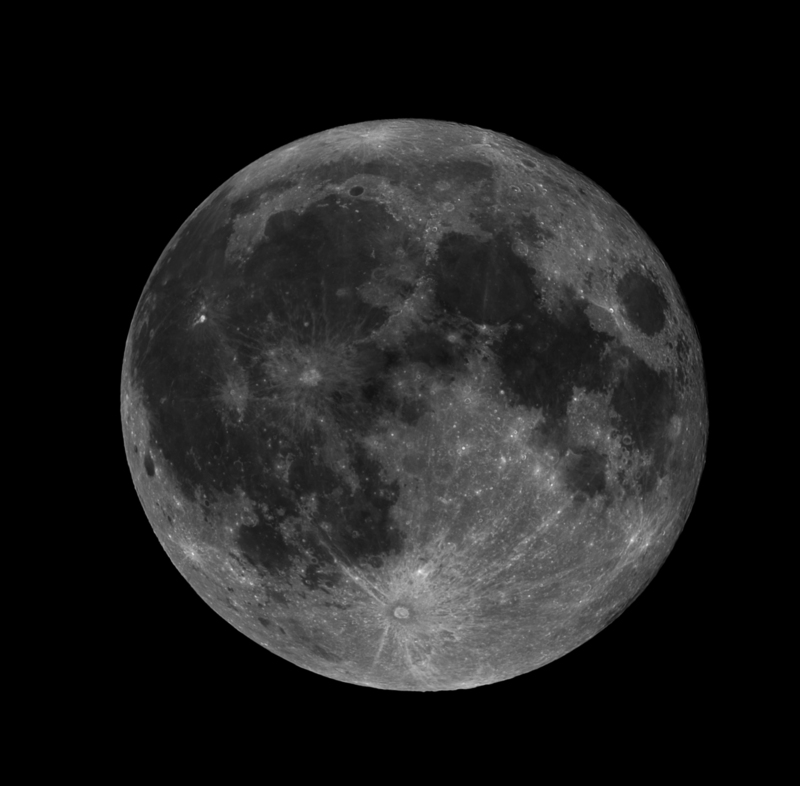 At full Moon - seen in the image below - the rays of material that were ejected when it was formed can be see arcing across the surface. 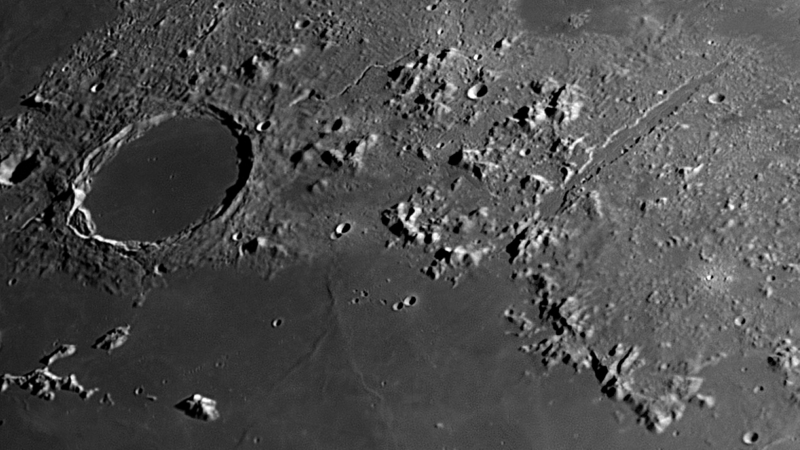 Copernicus is about 800 million years old and lies in the eastern Oceanus Procellarum beyond the end of the Apennine Mountains. 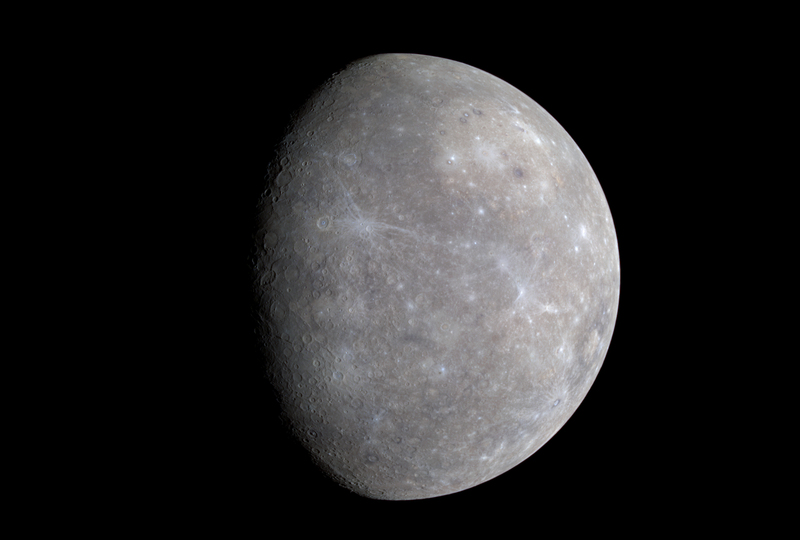 It is 93 km wide and nearly 4 km deep and is a clasic "terraced" crater. Both can be seen with binoculars. The Crab Nebula, M16, imaged by Nik Szymanek. This image was taken using the Faulkes Telescope North by Nik Szymanek - one of the UK's leading astro-photograpers. 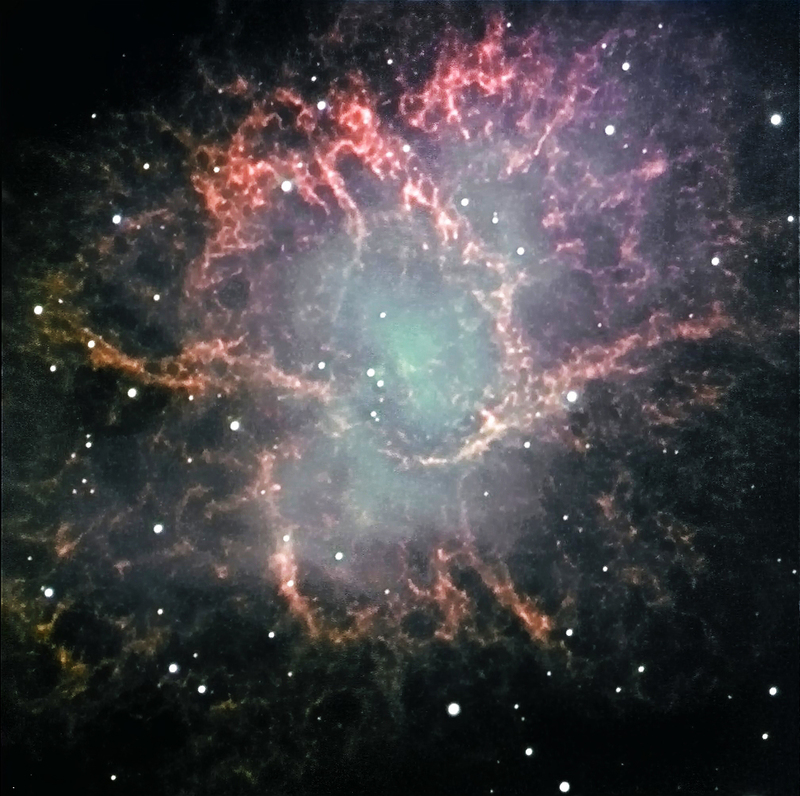 The Crab nebula - the first entry in Charles Messier's catalogue - is the remnant of a supernovae that was seen to explode in the year 1054. It is visible as the lower right of the pair of stars at the centre of the nebula and is a "neutron star" just 30km across but weighing more than our Sun! Under the intense pressure of gravity, the protons and electrons fused to form neutrons and the compact object became stable as gravity was opposed by "neutron degeneracy pressure" - a quantum mechanical force. It is now spinning just under 30 times a second and emitting two opposed beams of light and radio waves which pass across our location in space. We thus detect very regular pulses and so objects like this are called pulsars. At 8.4 magnitudes it is easily seen in a small telescopes under dark transparent skies appearing as a smudge of light which is a little underwhelming to see! Jupiter starts the month rising around 1 a.m. and brightens from magnitude -2.3 to -2.5 as the month progresses whilst its angular size increases slightly from 40 to 43 arc seconds. By month's end it rises by ~11 pm so will be due south around 3 am. 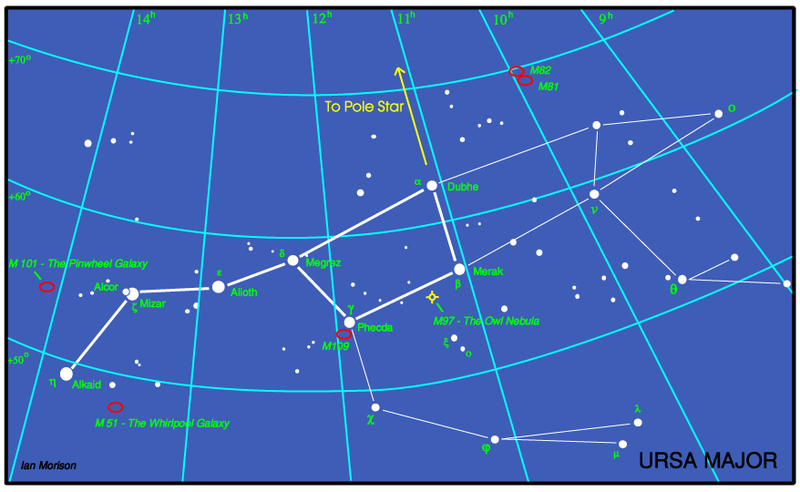 Sadly it is heading towards the southern part of the ecliptic and currently lies in the southern part of Ophiuchus just above Scorpius so, as it crosses the meridian, it will only have an elevation of ~ 14 degrees. 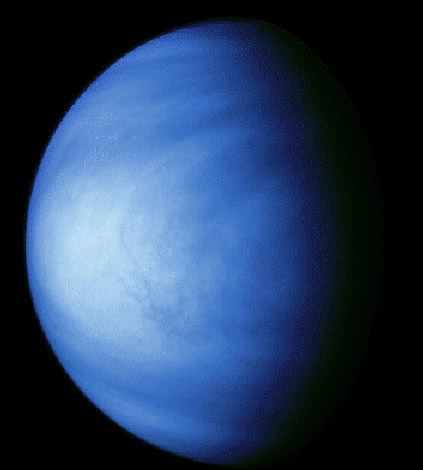 Atmospheric dispersion will thus take its toll and an atmospheric dispersion corrector would greatly help to improve our views of the giant planet. 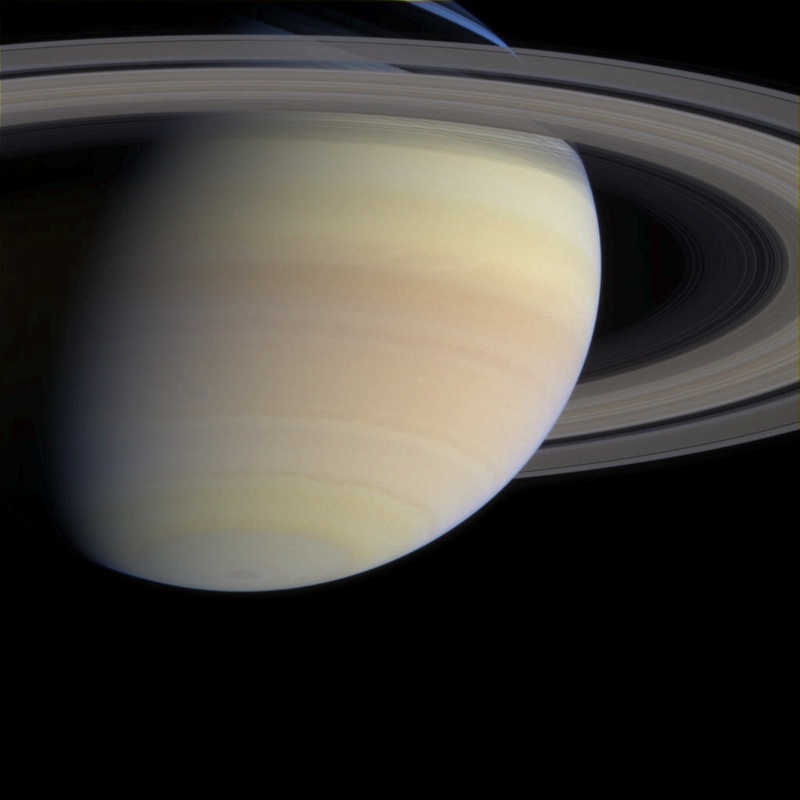 Saturn, shining with a magnitude increasing from +0.6 to +0.5 during the month, rises around 3 am on April 1st but around 1 am by month's end. Its disk is ~17 arc seconds across and its rings - which are still nicely tilted from the line of sight - spanning 36 arc seconds across. 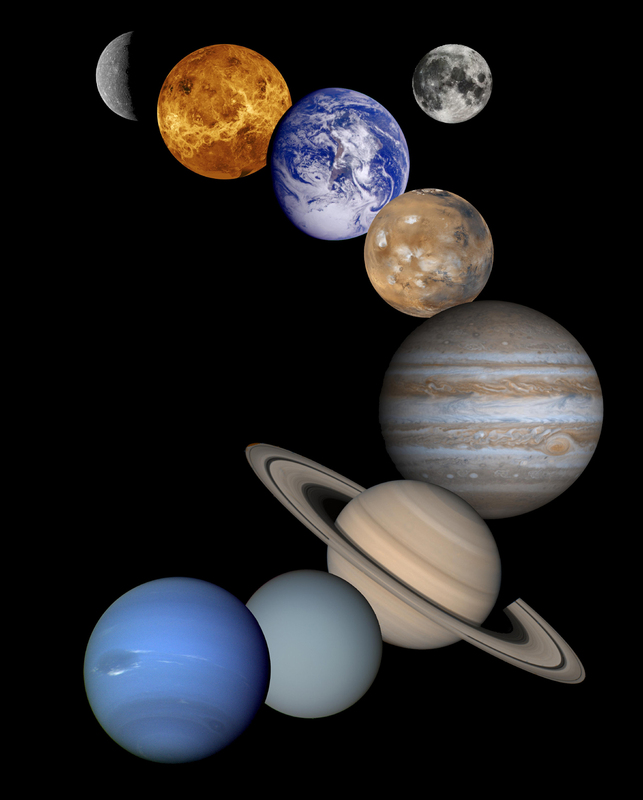 By the end of April, Saturn will near the meridian just before sunrines so morning twilight is the best time to observe it but, sadly, now in Sagittarius it is at the lowest point of the ecliptic and will only reach an elevation of ~14 degrees. As with Jupiter, an atmospheric dispersion corrector will help improve our view. The April Sky in the south - mid evening. 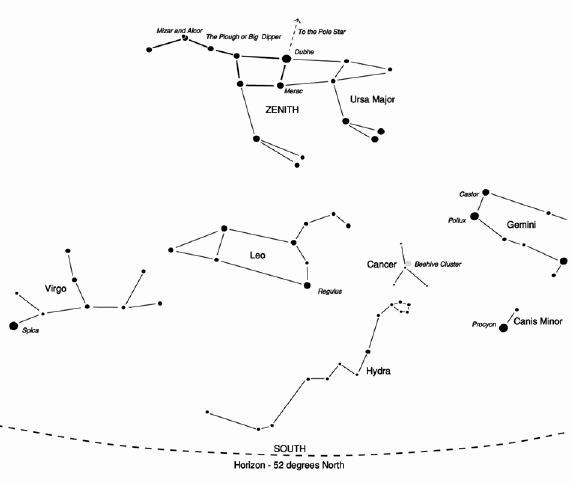 This map shows the constellations seen in the south in mid-evening. 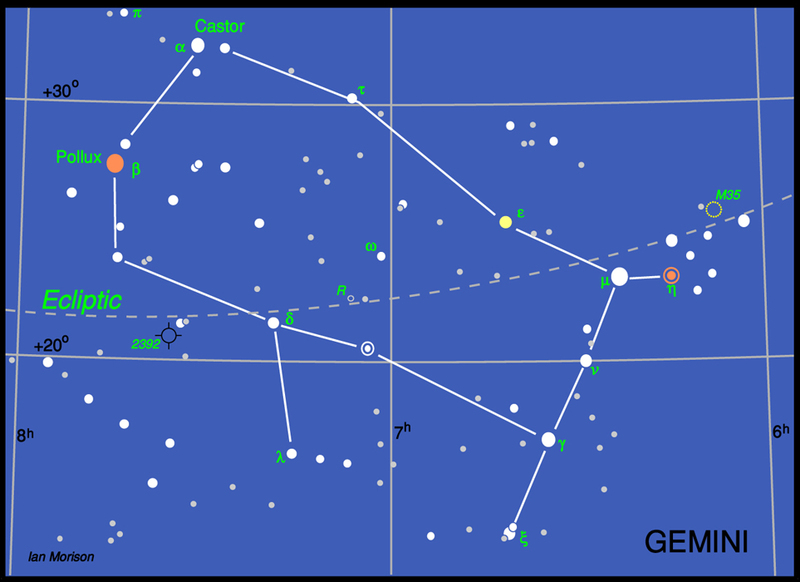 The constellation Gemini is now setting towards the south-west and Leo holds pride (sic) of place in the south with its bright star Regulus. Between Gemini and Leo lies Cancer. 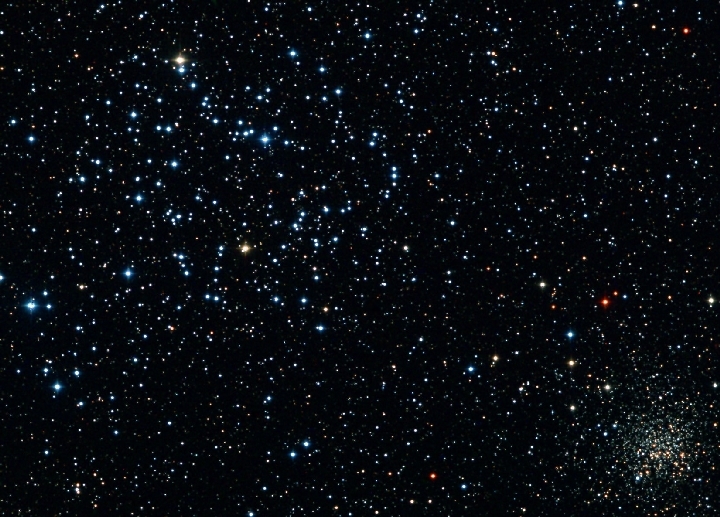 It is well worth observing with binoculars to see the Beehive Cluster at its heart. 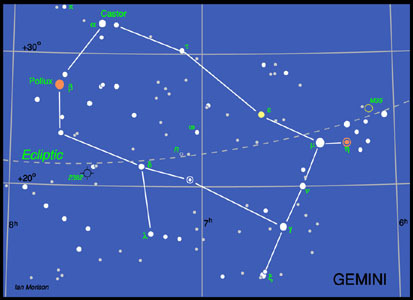 Below Gemini is the tiny constellation of Canis Minor whose only bright star is Procyon. 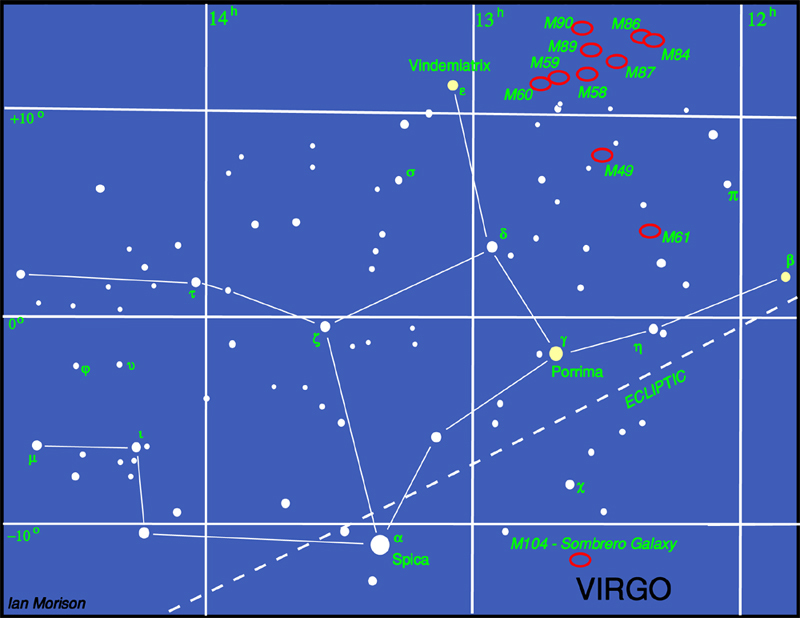 Rising in the south-east is the constellation Virgo whose brightest star is Spica. Though Virgo has few bright stars it is in the direction of of a great cluster of galaxies - the Virgo Cluster - which lies at the centre of the supercluster of which our local group of galaxies is an outlying member. The constellation Ursa Major is high in the northern sky during the evening this month and contains many interesting objects. 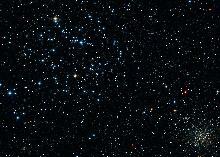 M35 is an open star cluster comprising several hundred stars around a hundred of which are brighter than magnitude 13 and so will be seen under dark skies with a relativly small telescope. It is easily spotted with binoculars close to the "foot" of the upper right twin. 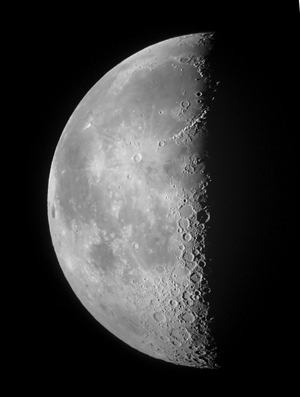 A small telescope at low power using a wide field eyepiece will show it at its best. Those using larger telescopes - say 8 to 10 inches - will spot a smaller compact cluster NGC 2158 close by. NGC 2158 is four times more distant that M35 and ten times older, so the hotter blue stars will have reached the end of their lives leaving only the longer-lived yellow stars like our Sun to dominate its light. 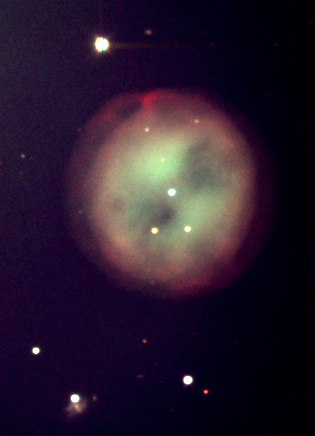 To the lower right of the constellation lies the Planetary Nebula NGC2392. As the Hubble Space Telescope image shows, it resembles a head surrounded by the fur collar of a parka hood - hence its other name The Eskimo Nebula. The white dwarf remnant is seen at the centre of the "head". The Nebula was discovered by William Herschel in 1787. It lies about 5000 light years away from us. The constellation Leo is now in the south-eastern sky in the evening. One of the few constellations that genuinely resembles its name, it looks likes one of the Lions in Trafalger Square, with its main and head forming an arc (called the Sickle) to the upper right, with Regulus in the position of its right knee. Regulus is a blue-white star, five times bigger than the sun at a distance of 90 light years. It shines at magnitude 1.4. Algieba, which forms the base of the neck, is the second brightest star in Leo at magnitude 1.9. 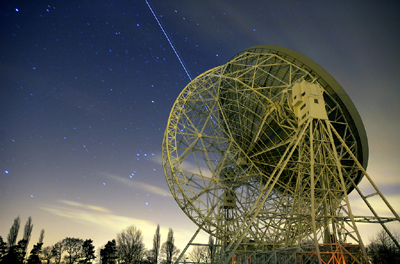 With a telescope it resolves into one of the most magnificent double stars in the sky - a pair of golden yellow stars! They orbit their common centre of gravity every 600 years. This lovely pair of orange giants are 170 light years away. Leo also hosts two pairs of Messier galaxies which lie beneath its belly. 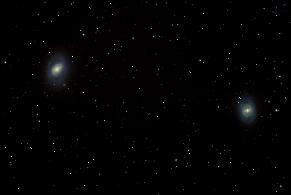 The first pair lie about 9 degrees to the west of Regulus and comprise M95 (to the east) and M96. They are almost exactly at the same declination as Regulus so, using an equatorial mount, centre on Regulus, lock the declination axis and sweep towards the west 9 degrees. They are both close to 9th magnitude and may bee seen together with a telescope at low power or individually at higher powers. 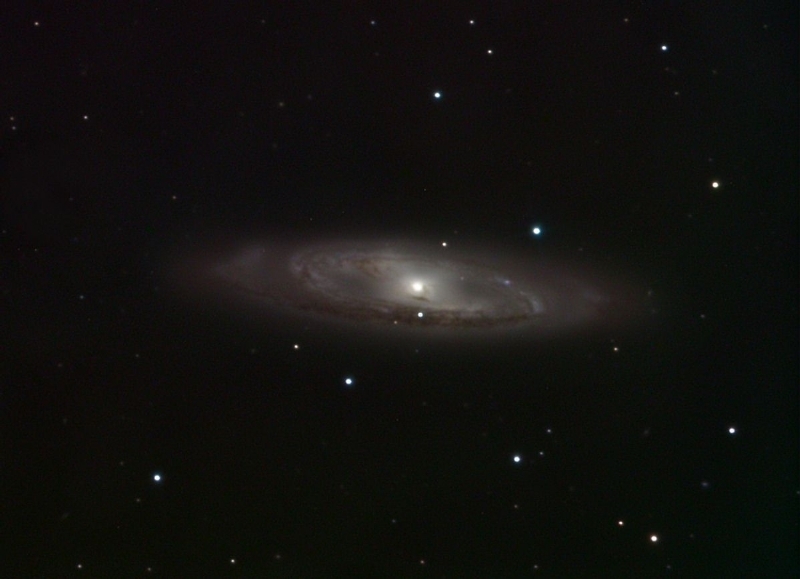 M65 is a type Sa spiral lying at a distance of 35 millin klight years and M66, considerably bigger than M65, is of type Sb. Type Sa spirals have large nuclei and very tightly wound spiral arms whilst as one moves through type Sb to Sc, the nucleus becomes smaller and the arms more open. The second pair of galaxies, M95 and M96, lie a further 7 degrees to the west between the stars Upsilon and Iota Leonis. 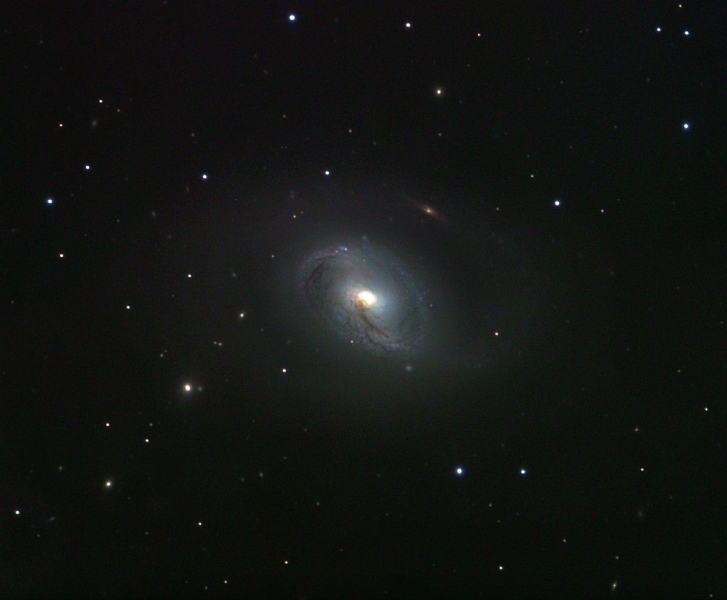 M95 is a barred spiral of type SBb. It lies at a distance of 38 million light years and is magnitude 9.7. 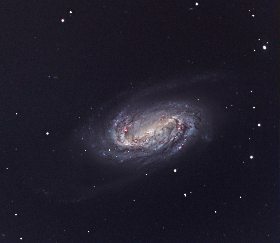 M96, a type Sa galaxy, is slightly further away at 41 million light years, but a little brighter with a magnitude of 9.2. 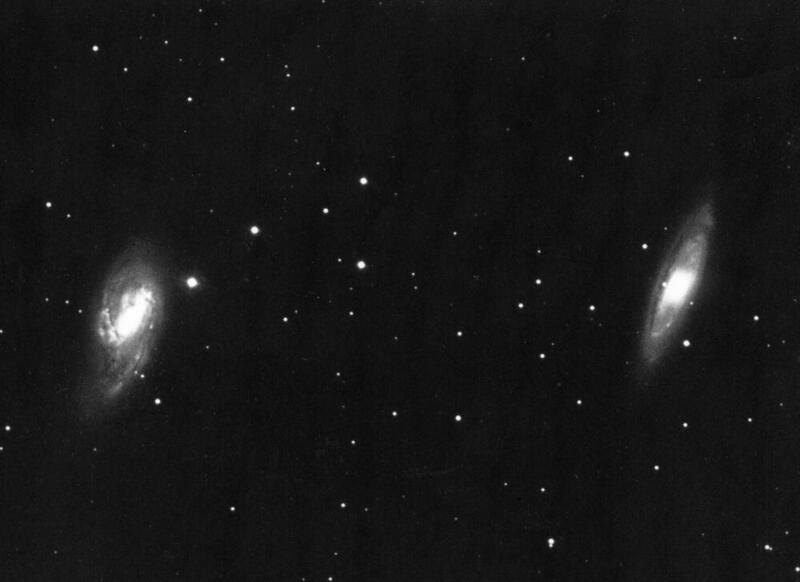 Both are members of the Leo I group of galaxies and are visible together with a telescope at low power. 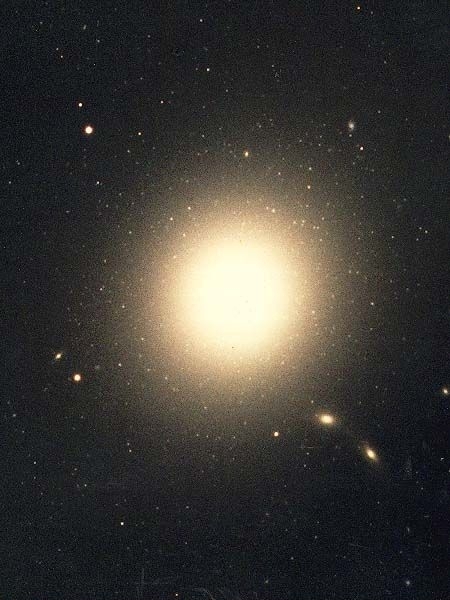 There is a further ~9th magnitude galaxy in Leo which, surprisingly, is in neither the Messier or Caldwell catalogues. It lies a little below lambda Leonis and was discovered by William Herschel. 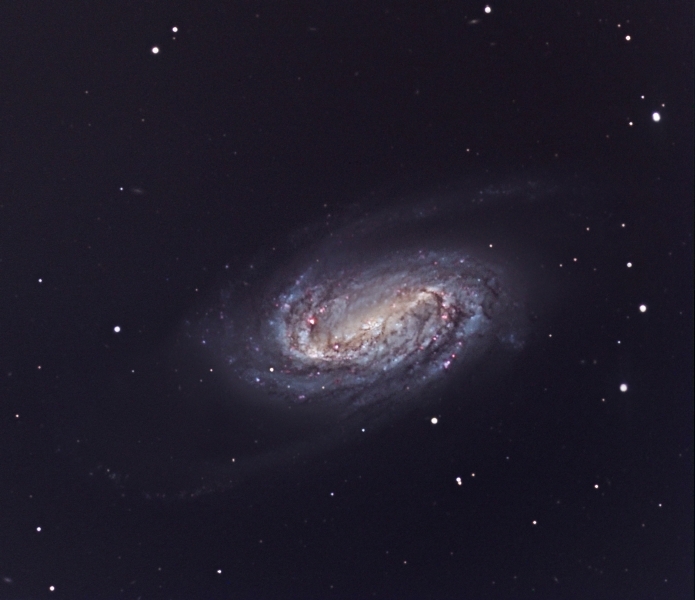 No 2903 in the New General Catalogue, it is a beautiful type Sb galaxy which is seen at somewhat of an oblique angle. 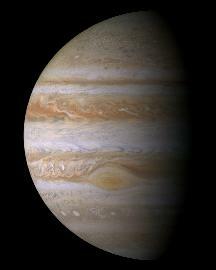 It lies at a distance of 20.5 million light years. Virgo, rising in the east in late evening this month, is not one of the most prominent constellations, containing only one bright star, Spica, but is one of the largest and is very rewarding for those with "rich field" telescopes capable of seeing the many galaxies that lie within its boundaries. Spica is, in fact, an exceedingly close double star with the two B type stars orbiting each other every 4 days. Their total luminosity is 2000 times that of our Sun. 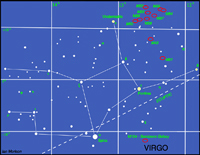 In the upper right hand quadrant of Virgo lies the centre of the Virgo Cluster of galaxies. 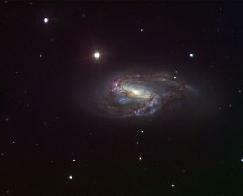 There are 13 galaxies in the Messier catalogue in this region, all of which can be seen with a small telescope. 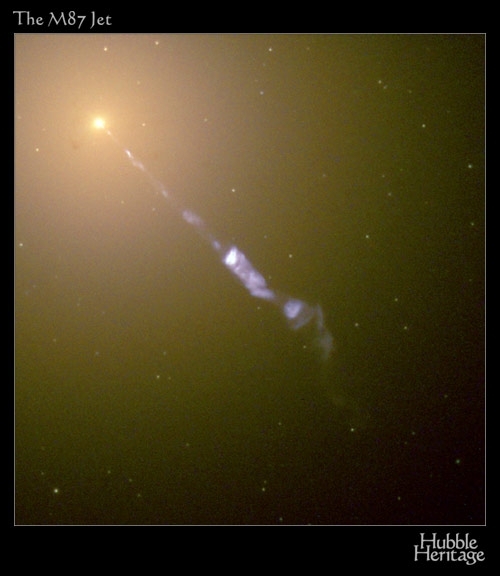 The brightest is the giant elliptical galaxy, M87, with a jet extending from its centre where there is almost certainly a massive black hole into which dust and gas are falling. This releases great amounts of energy which powers particles to reach speeds close to the speed of light forming the jet we see. 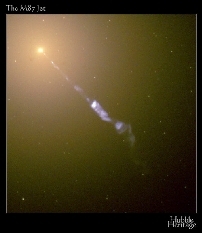 M87 is also called VIRGO A as it is a very strong radio source. Below Porrima and to the right of Spica lies M104, an 8th magnitude spiral galaxy about 30 million light years away from us. Its spiral arms are edge on to us so in a small telescope it appears as an elliptical galaxy. 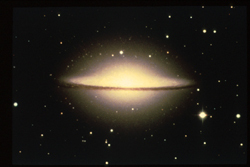 It is also known as the Sombrero Galaxy as it looks like a wide brimmed hat in long exposure photographs. 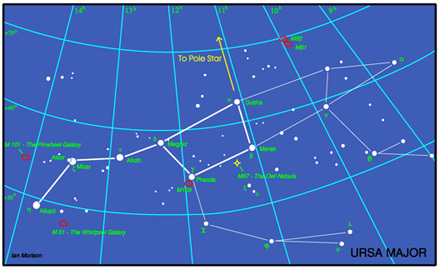 The stars of the Plough, shown linked by the thicker lines in the chart above, form one of the most recognised star patterns in the sky. Also called the Big Dipper, after the soup ladles used by farmer's wives in America to serve soup to the farm workers at lunchtime, it forms part of the Great Bear constellation - not quite so easy to make out! The stars Merak and Dubhe form the pointers which will lead you to the Pole Star, and hence find North. The stars Alcor and Mizar form a naked eye double which repays observation in a small telescope as Mizar is then shown to be an easily resolved double star. 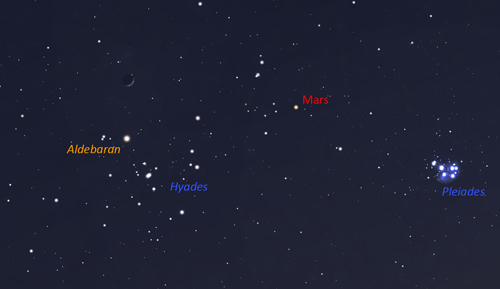 A fainter reddish star forms a triangle with Alcor and Mizar. Ursa Major contains many interesting "deep sky" objects. The brightest, listed in Messier's Catalogue, are shown on the chart, but there are many fainter galaxies in the region too. 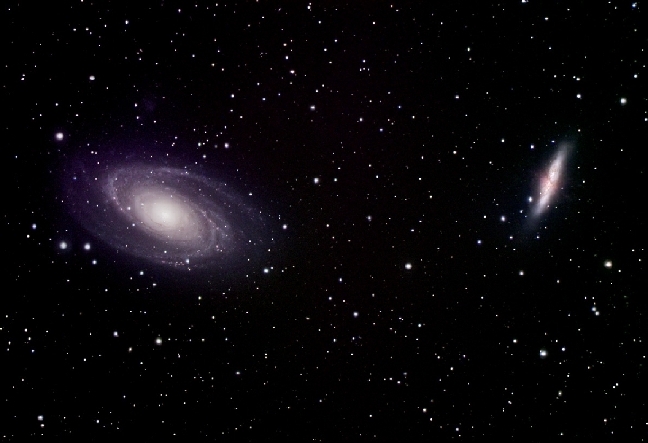 In the upper right of the constellation are a pair of interacting galaxies M81 and M82 shown in the image below. M82 is undergoing a major burst of star formation and hence called a "starburst galaxy". 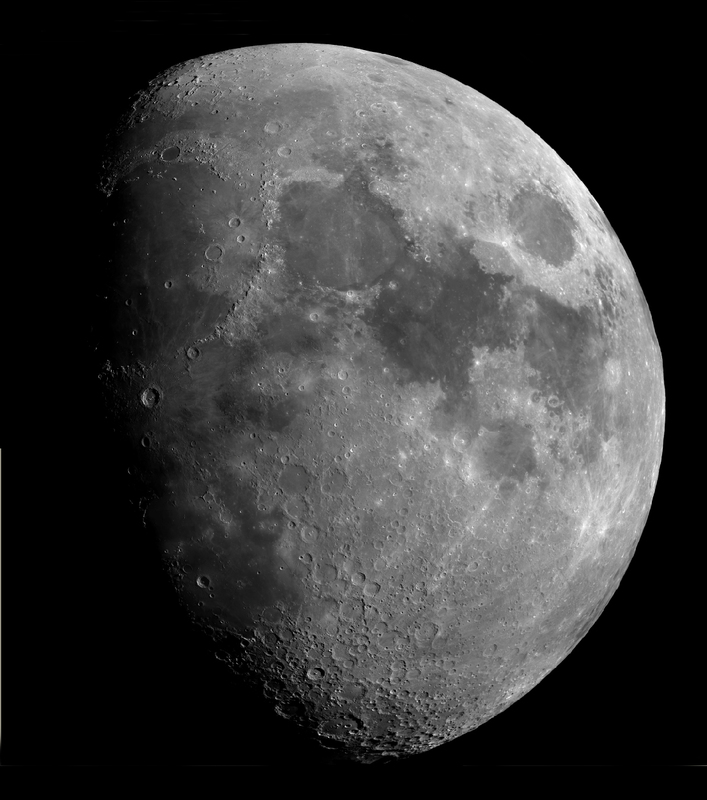 They can be seen together using a low power eyepiece on a small telescope. 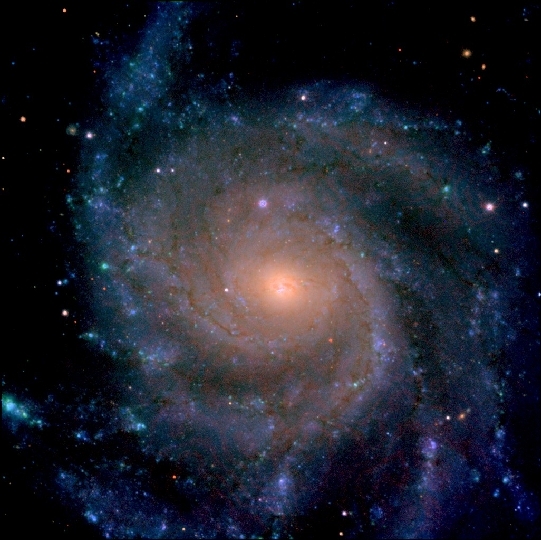 Another, and very beautiful, galaxy is M101 which looks rather like a pinwheel firework, hence its other name the Pinwheel Galaxy. 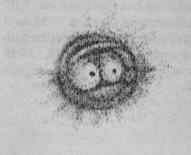 It was discovered in1781 and was a late entry to Messier's calalogue of nebulous objects. It is a type Sc spiral galaxy seen face on which is at a distance of about 24 million light years. 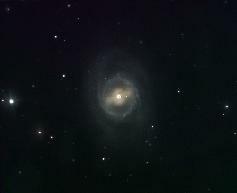 Type Sc galaxies have a relativly small nucleus and open spiral arms. With an overall diameter of 170,000 light it is one of the largest spirals known (the Milky Way has a diameter of ~ 130,000 light years). 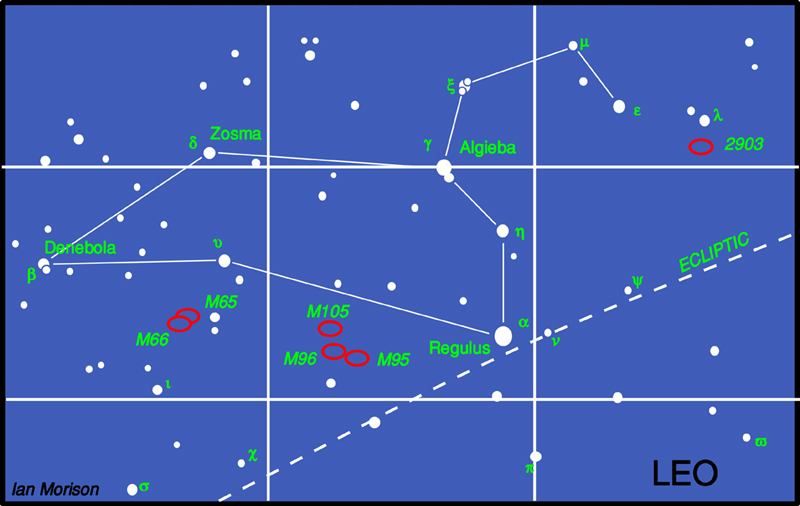 Though just outside the constellation boundary, M51 lies close to Alkaid, the leftmost star of the Plough. 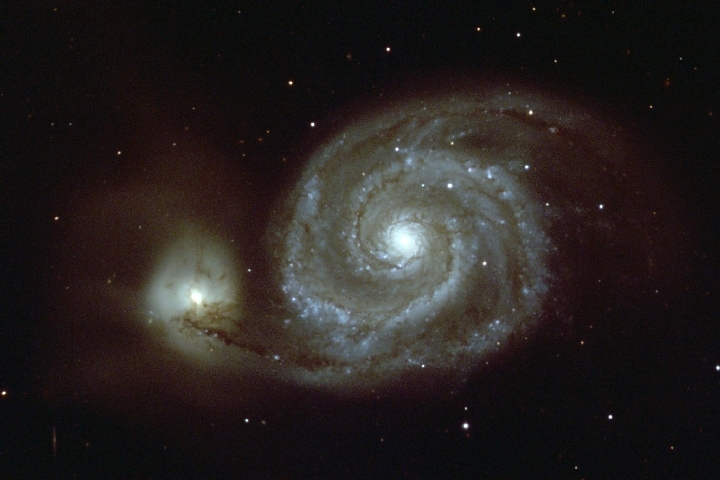 Also called the Whirlpool Galaxy it is being deformed by the passage of the smaller galaxy on the left. 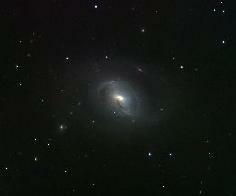 This is now gravitationally captured by M51 and the two will eventually merge. M51 lies at a distance of about 37 million light years and was the first galaxy in which spiral arms were seen. 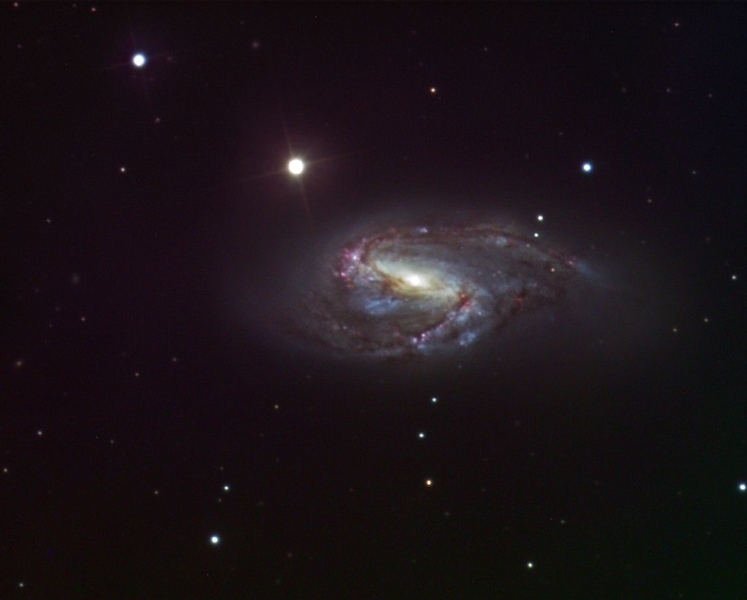 It was discovered by Charles Messier in 1773 and the spiral structure was observed by Lord Rosse in 1845 using the 72" reflector at Birr Castle in Ireland - for many years the largest telescope in the world. Lying close to Merak is the planetary nebula M97 which is usually called the Owl Nebula due to its resemblance to an owl's face with two large eyes. It was first called this by Lord Rosse who drew it in 1848 - as shown in the image below right. Planetary nebulae ar the remnants of stars similar in size to our Sun. When all possible nuclear fusion processes are complete, the central core collpses down into a "white dwarf" star and the the outer parts of the star are blown off to form the surrounding nebula.